Traveling is about taking risks and conquering your fears. For me, one of those fears is sharks. When I first started snorkelling it took a long time for me to get comfortable in the open water, always afraid that something was going to make a meal out of me. Like many people who are afraid of the water , watching the movie Jaws as a child was one of the major factors. On my round the world trip it was do or die. Either I conquered my fear or miss out on the numerous underwater adventures available around the world. Thanks to the encouraging captain of the boat on my Whitsundays Australia trip, I grew to learn that sharks were not lurking around every coral waiting to catch you off guard. Over time, I came to enjoy and respect them and it meant I could really love the underwater world. A big part of my travels is now revolved around snorkeling and diving because I have overcome most of these fears: chasing black tip reef sharks in the Palau Perentian Island is no big deal. 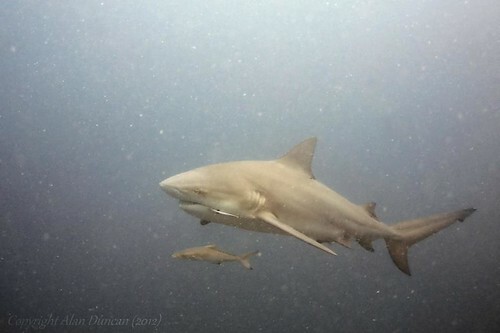 Being surrounded by 11 baby reef sharks at the Surin National Park was exciting and fun, and diving Sipidan with a dozen white tip reef sharks, whilst still a bit daunting was beyond incredible. 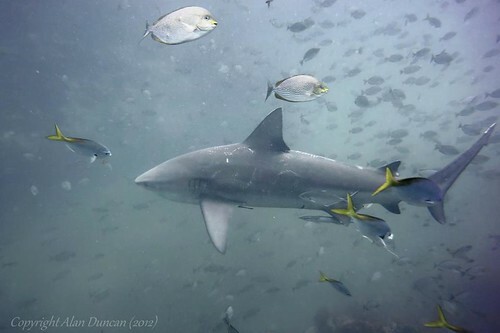 For my 30th birthday, my goal was to go cage diving with Great Whites in South Africa. Now that would be the ultimate testament to get over my fear, right? Well, I didn’t get to Africa this year but I still got another chance to test my fears against the number one deadliest shark in the world. Only for this experience shark diving, I wouldn’t be in a cage. Ever since we arrived to Koh Phangan in May, we wanted to go diving at Sail Rock. Known for it’s abundance of sea life, beautiful coral, and whale sharks, it is widely considered the best dive site in the gulf of Thailand. Having just missed these delicate giants diving in Utila during their whale shark frenzy in February, seeing a whale shark was a big item in my underwater bucket list. 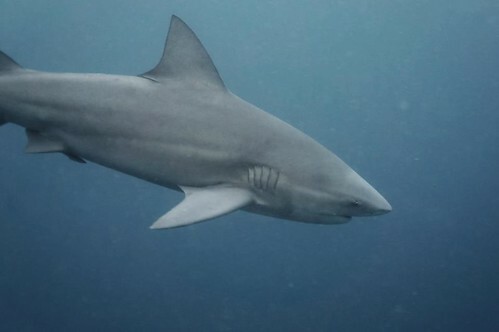 This year, however, Sail Rock has been host to another type of shark that has been getting everybody excited and causing a frenzy: Bull Sharks. Harry was one of the excited divers who could not wait to get close to these man eaters; I on the other hand was frightened beyond belief! We were diving with the Dive Inn, who had been recommended to us by fellow divers, and before we had even set off did their best to reassure me and keep me calm. It even got to the point where Wendy, my divemaster, was holding my hand as we descended in to the water, and continued to do so for the next fifty minutes. Now this is the part where you probably expect me to say how the experience was incredible and I’m a changed woman. Well, no I’m not going to say that. It was terrifying! These guys were BIG. There were moments where I was practically in tears from fear. 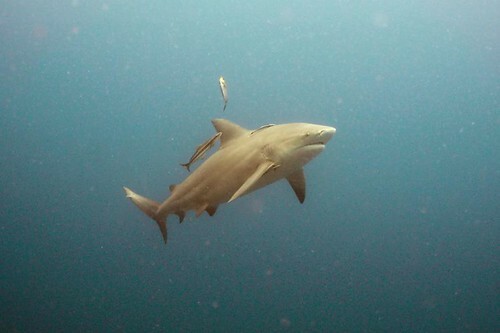 I will probably not be diving with bull sharks again, and just stick to the reef sharks and leopard sharks that are much smaller and friendlier. However, at the end of the day I can honestly say I’m glad I did it – I challenged myself and I won. It helped me gain even more respect for sharks and feel comfortable in knowing that I’m not seen as a happy meal. Wendy explained how the bull sharks think, and why it is safe to be in the water with them as long as precautions are taken and you dive responsibly. For Harry, and many other divers that day, it was one of the best dives he has ever experienced. He got the adrenaline rush and excitement that other people look for when encountering killer animals. I may not have enjoyed the bull sharks in the same way, but my dive was made complete with a Whale shark that swam right in front of me. For a few moments at least, I was relaxed and having a whale of time. I would just like to say a big thank you to Wendy and the Dive Inn team, without who I probably would have been shark bait!